The property was beautiful, well-equipped, and very cozy. We would love to return in the future. The team at Manzanita Beach Getaway are very easy to communicate with. We've been renting from them for about 3 years and in that time they have always responded quickly to emails or phone calls. They are friendly and accommodating- granting us early check-in and and late check-out whenever possible. We love renting from them! 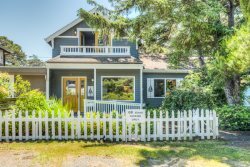 We have stayed in four homes managed by Manzanita Beach Getaway -I only rent from them because I know that all their homes will be well-equipped, clean and comfortable. I know that I can count on having comfortable linens, soft towels, good reading lights, and all the kitchen gadgets I could ever need. We will definitely rent the Legasea home again, and refer it to friends. What a great value for this beautiful home close to the beach and the luxuries of town, yet not crowded with neighbors and noise...loved the nature setting of the pond and views from the deck! Thank you for sharing! Both Danielle and Kelly were fantastic----super helpful and accommodating. Made the experience a breeze. Can't say enough about Legasea on the Pond----we loved it so much we can't wait to book our next trip! The DECK!!!! Amazing views of the pond and the ocean in the distance. Really enjoyed the house. Wonderful location bordering a natural bird/wildlife sanctuary, with only one house next to you. Very quiet and private but yet only a few blocks from the beach, easy walk. Lots of windows, nice light, great kitchen, cookware, etc. Clean and new interior, comfortable couches and beds. Would definitely stay here again!